Memoirs of a Man is the first book written by Christopher James. This fiction novel is centered around murder, scandal, and sexuality. Although a light book it's filled with heavy content that had me flipping pages quickly. The story is set in Houston, TX - a city not too far from my hometown, so I instantly felt represented. 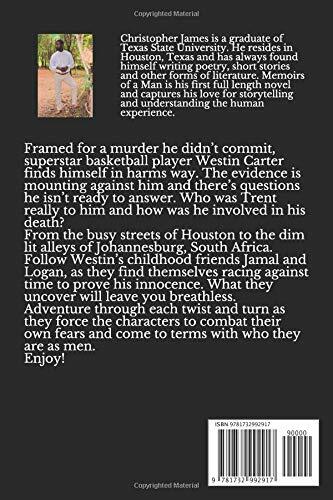 The more I read the deeper I fell into proving the innocence of young basketball player Westin through the themes of corruption, friendship, addiction and more. On top of the many themes, many other character stories are told which at times felt overwhelming. James delivers many layers to his creativity which would translate perfectly to film. The main characters, who are also old college friends, come from urban backgrounds and carry a lot of difficult yet relatable life experiences. Experiences including self-hate, deciphering loyalty, office culture and promotion, sexual diseases and more. This quick read of 130 pages had me intrigued throughout and I encourage you to get a copy of Memoirs of a Man as soon as possible. Memoirs of a Man is now available for purchase on Amazon here.